Jordan Mescher got a steal and drove in for this "easy" 2 pointer. PLAINVIEW — Having lost twice to Boyd County, Elgin Public-Pope John was determined to not let it happen a third time as they defeated the Lady Spartans 50 to 23. It was a mismatch from the start as the Wolfpack used a full-court press to take the Lady Spartans out of their comfort zone. The Lady Spartans struggled to generate any offense during the entire game, never breaking double figure scoring in any of the four quarters. 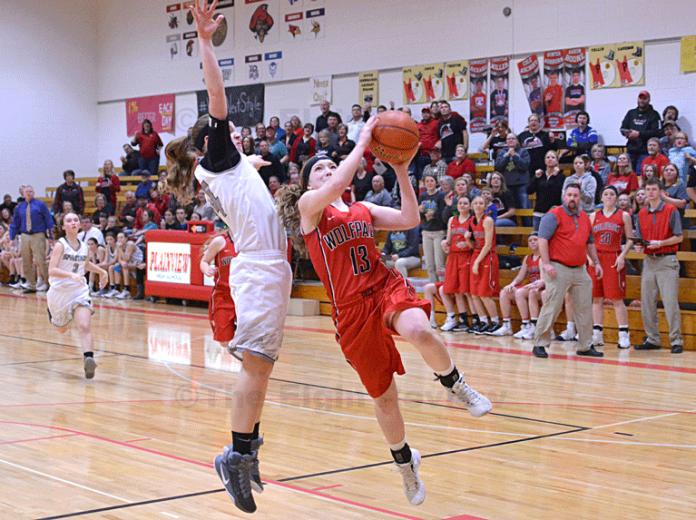 Boyd County had no answer for the Wolfpack duo of Baylee and Ally Wemhoff in the first half as they combined for 14 of the team’s 16 points in the quarter as EPPJ took a 16 to 8 lead. The Wolfpack’s quick attack offense continued to put up points as baskets by Lydia Behnk, Jordan Mescher and Elizabeth Selting gave the Wolfpack a 22 to 10 lead with three minutes to go in the half. Boyd County managed to trim the lead to 10 points at the end of the half. Any chance the Lady Spartans had to get back in the game evaporated in the third quarter as EPPJ padded their lead. A basket by Paige Meis gave the Wolfpack a 28 to 16 lead near the halfway point of the third quarter. In the quarter EPPJ outscored Boyd County 10 to 7. The final eight minutes of the game saw the Wolfpack close out the Lady Spartans in dominating fashion. There was little for Boyd County fans to cheer about as the team managed just two point. At the other end of the court, EPPJ scored 16 points. Ally Wemhoff started the quarter with a trey and senior Amy Nelson put the finishing touches on this masterpiece with a free throw. In between, the biggest cheers by Wolfpack fans may have come when Mescher stole the ball near midcourt and then beat a Boyd County defender to the basket for a layup to make the score 45 to 22. Behnk had six of her eight points in the quarter. Ally Wemhoff led the Wolfpack with 16 points, Baylee Wemhoff was the only other player to score in double figures with 10. Next up for EPPJ is a game against North Central Thursday night in the subdistrict finals. Baylee Wemhoff 10, Ally Wemhoff 16, Elizabeth Selting 7, Lydia Behnk 8, Jordan Mescher 6, Paige Meis 2, Amy Nelson 1.